You’ve seen her on the runway. You’ve seen her onscreen. It’s fashion-meets-life advice inspired by our wonderfully bold fave, Queen Cara Delevingne. If there’s one thing I can say for certain, it’s that you’re under no obligation to be the same person you were in high school. So why not run with it? Try a new look; be a bit bold and I’m not just talking about fashion. College has a lot to offer and you’d be remiss to not give something a shot just because it’s different. Take an improv class. Join the scuba diving club. Forget about mundaneness of life and you’ll remember it was never mundane in the first place. You’ve seen the headlines: Be Fresh! Be Original! Be Unique! Almost every style guide out there has some view on the same tired idea. But how fun is it to take something you love and show it off to the world? You can tell Delevingne always throws a bit of herself into everything she does, from her street-inspired style, to beat boxing and everything in between. Whether you’re obsessed with Game of Thrones or maybe a book that gave you all the feels ( *Cough* “Paper Towns” *Cough*), be inspired. Add a little piece of it to your daily look. Not only will you feel like a total badass, but it’s a conversation starter too. You never know, you might just end up meeting your new BFF in physics lab. Perfection? Nope. Boring. Toss it. Because honestly who has the time? You’ve got two history papers, a macro exam, bio lab at 8 a.m. and you over drafted your debit card. Again. Besides, sweatpants never go out of fashion. In fact, why stop there? Just wear a bedazzled track suit. That was totally a thing in the 1990s. All jokes aside, you’ve worked really hard to get to where you are today, so reflect that in everything you do. Maybe you’re a jeans and t-shirt connoisseur; maybe you rock circle skirts on the reg. Whatever it is, wear it like Finals Week is Fashion Week and the quad is the freaking runway. I’m not saying a common taste in clothes is all it takes to form a friendship, but it does present an opportunity for some killer group shots. Personally, I’m not a fan of posing for hours on end just to get that one unicorn pic everyone is happy with. But it’s fall, right? Arguably the best season for fashion. Fall also means football, so rather than snapping a thousand un-ironic selfies of you and your roommates’ pumpkin spice lattes, take a candid battle photo of everyone in their game day gear. Trust me, they’re a lot more interesting to look back on. Look at these guys, internationally renowned movie stars with press tours, interviews, hours upon hours of traveling and they still manage to have a great time. Collegiate pressure is no joke either, but if you take yourself too seriously you’ll have a meltdown—or worse—a mad, stress breakout. Remember to loosen up every now and then and enjoy yourself. Near a lake? Take your roommates kayaking. By a big city? Check out that random, obscure vegan coffee shop everyone swears is good. None of the above? Start a tradition; have an end-of-finals picnic with your friends at your favorite spot on campus. Whatever you do, enjoy yourself. You’ve got four years of undergrad (maybe), so make the best of them while you still have the freedom. This isn’t necessarily fashion-related, but it certainly involves style. If someone or something is bothering you, there’s nothing wrong with standing up for yourself. Lately the women of Hollywood have been fighting back against traditionally sexist interview questions, and Delevingne is no different. 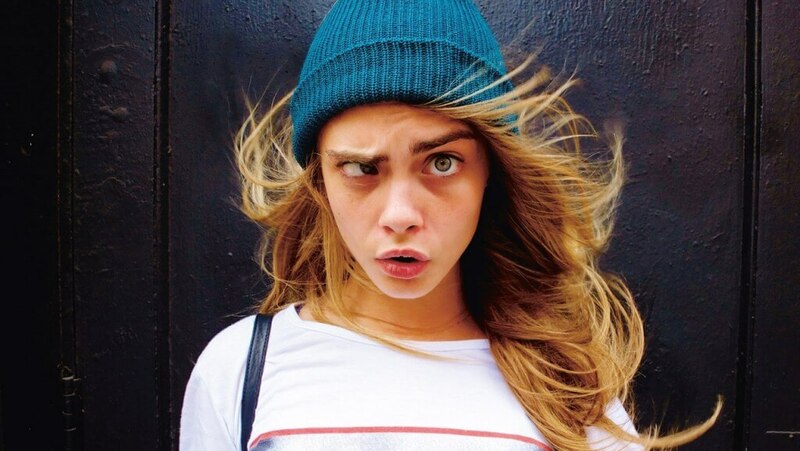 During a Paper Towns press tour, a few California talk show hosts asked her a series of belittling questions after referring to her twice as “Carla.” Being the queen that she is, Delevingne responded with composure but not without a rightful heaping of sarcasm before leaving that sham of an interview. Be prepared to face adversity and take some time to research the world around you. You’re an adult now—you have every right to act accordingly. People are complex, multi-faceted individuals; there’s so much variety in them, like diamonds or a Chipotle burrito bowl. However you see it, don’t feel pressured to box yourself in. Delevingne left the fashion industry to pursue film. She said it made her feel “hollow” and that it hindered her growth as a person. That’s such a brave thing to do because change is hard. It’s really hard. But college is such a wonderful opportunity to explore and figure things out. Of course this extends far beyond the realm of fashion, but the idea still applies. In the words of our inimitable heroine: “You have to trust in yourself to know what to do,” and she’s right. At the end of the day, no one knows you better than you.